Recent studies have found that daily hours in a chair can take years off your expected life span. To break it down specifically, they’ve found that on average, every hour per day you spend sitting increases your risk of dying from anything (called “all-cause mortality” in geek speak) by 2%. That might not sound like much but it gets worse… if you’re a big-time chair hog, once you’ve been sitting for 7 hours, each additional hour in your seat increases that death risk by 5%. A little math tells that 12 seated hours during each day increases your overall risk of dying by 39%!!! The most depressing part is that these figures are independent of your exercise level. That means that even if you’re killing it in the gym 5 days a week, plopping down in your office for 8 hours afterwards is still just as bad for you! Is that comfy chair you’re settled into right now really worth years off your life? What a downer, right? Well, since knowledge is power let’s decide now to make a few easy but important changes for the good of our lives! Yes, there’s actually light at the end of the tunnel. 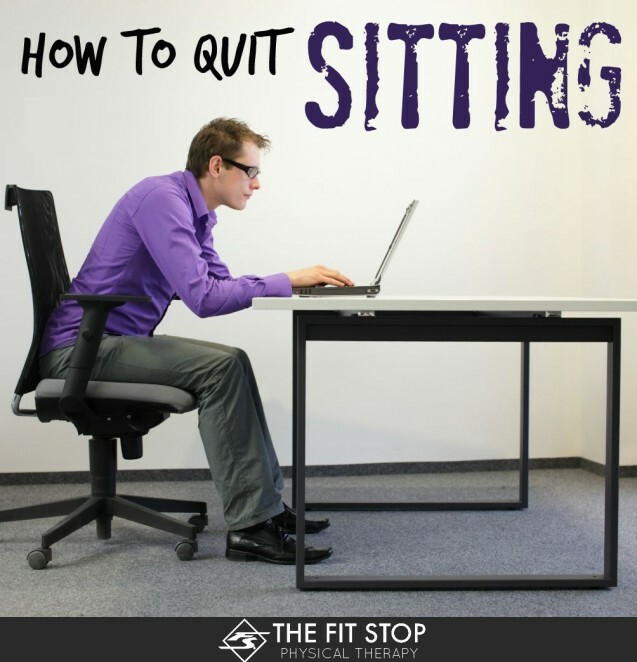 For those of us who are largely sedentary, the sheer act of getting up to get some blood moving a couple times an hour can offset the ill effects of sitting. For more active individuals, experts recommend replacing some sitting time with “purposeful exercise” to get a benefit. There are some pretty easy things we can do to interrupt our lazy ways and get moving more during the day. I’d challenge you to find a couple of following ideas (starting with #1) that work for you and start implementing them today. It’s a decision that could have massively positive long term effects on your quality and quantity of life! This first step to any change is to decide how you want to change. Set yourself a goal right now. That means WRITE IT DOWN SOMEWHERE! A real goal should also be quantifiable. Whether it’s steps taken throughout the day, time sitting before taking a break or simply getting in a few extra mini-workouts, pick something that you can actually measure. Next, tell your family or post it on social media (see #5). Be accountable! Now, start doing something about TODAY! Most of us are already carrying around one of the most potent fitness motivation tools we could ever ask for! If you have a smartphone, start making good use of it to track your progress throughout the day. Using Google Fit, Apple’s Health platform, or a huge variety of other free health tracking apps, you can easily measure your daily steps and track activity. Getting a Fitbit, or similar step tracking device can also be a strong catalyst for change. 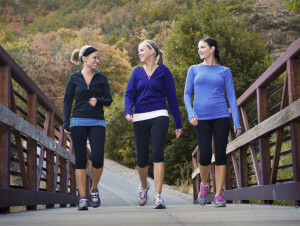 The average American gets around 5000 steps/day. We should be aiming for closer to double that! Start tracking those steps! Sometimes just remembering to be active is half the battle. Taking a break every 30 minutes reaps great rewards. It’s so easy to get zoned in with our work routine or that awesome TV show, that we can find ourselves sitting for 2-3 hours without blinking (yep, I’m in that boat right now)! Did you know that your phone can give you a reminder to move after you’ve been sedentary for too long? On the iPhone, try downloading the free app “Move: Daily Activity to Stay Healthy” or use on an android phone, get the free “Move a Bit” app to get gentle reminders to stand up after sitting for too long. Some smartwatches and fitness trackers have this feature built in as well. The Jawbone UP2, Garmin Vivosmart, Polar Loop and Asus Vivowatch are just a few with active notifications that let you know when it’s time to get off your sitting bones. There are a bunch of ways to fix your ergonomic setup to promote moving more. Short of putting everything on your desk just out of reach, one of those ways is to switch to a standing desk. You can always buy a convertible sitting-standing desk. Though completely cool, they run a little on the pricey side, but this is years’ worth of your life we’re talking about here! You can always take the DIY route, do a quick google search and find ways to raise your desk up on your own with a little creativity. Putting more time on your feet each day takes some getting used to, but can be a great way to avoid death by chair. There are a million little changes you could make to increase your daily activity. One of the best ways to motivate yourself to actually stick with it is to be both accountable to someone and get motivated by them making changes along with you. Pick a family member, coworker or friend that you interact with every day, challenge them to read this post and act on it! Use an app like “Nextrack” or the social aspect of a Fitbit to compete your way to less sitting! Decide right now to do something different throughout your day. Make it a small change, but a permanent one. The stakes are raised for sitting down, so don’t let comfort and ease cut into your health and quality of life! What is a sprain and what can I do about it?